Board also reelects Ellen Zane as vice chair and elects Grace Speights as secretary and Amr ElSawy as charter trustee. Nelson Carbonell began a second, three-year term as chair of the Board of Trustees on July 1. The George Washington University Board of Trustees has elected Nelson A. Carbonell to a second term as chair. Mr. Carbonell, B.S. '85, began a three-year term on July 1. Mr. Carbonell is founder, chairman and CEO of Nelson Carbonell and Associates, a Reston, Va.,-based firm that assists middle-market companies with strategy, financing, operations, technology and leadership. He earned a bachelor’s degree in electrical engineering at GW and was inducted into the School of Engineering and Applied Science Hall of Fame in 2011. He has served as chair of the board since 2013, following six years as vice chair. “It has been a great honor to serve as chair of the Board of Trustees, and I look forward to continuing to work with the administration, faculty and the board to build on the progress we have made on behalf of the George Washington University,” said Mr. Carbonell. Grace Speights, J.D. '82, Amr ElSawy, M.S. '81, and Ellen Zane, B.A. '73. The board also elected Ellen Zane, B.A. ’73, to a second term as vice chair and Grace Speights, J.D. ’82, as secretary. 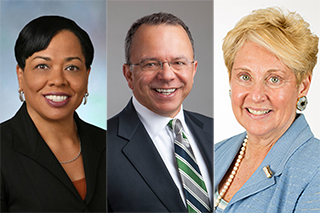 Three charter members were re-elected: Roslyn Brock, M.S.H.A ‘89, Michael Hoffman and Madeleine Jacobs, B.S. '68 and D.Sc. (Honorary) '03. The board also elected Amr ElSawy, M.S. ’81, as a new charter trustee. Mr. ElSawy has been the CEO of Noblis since October 2007 and serves as the president responsible for the general management and strategic direction of its overall scientific, technical, financial and administrative activities. He has served on the Noblis Inc. Board of Trustees since 2007. Mr. ElSawy has extensive experience leading organizations and developing innovative solutions to some of the most complex challenges facing public sector enterprises in national security, transportation, health and the environment. His work experience includes research and development, complex engineering of information and telecommunications systems, modeling and simulation, enterprise transformation using cloud and high performance computing, program management and acquisition of large scale systems. He has also earned an international reputation as a leader in aviation, informing domestic and international aviation policy. In 2012, he was elected to the George Washington University School of Engineering and Applied Science Hall of Fame, and in 2016 he was selected to the Wash100 by Executive Mosaic. Mr. ElSawy also currently serves as a board member of the Northern Virginia Technology Council.